One of the best ways to spend a vacation in the mountains is to scale back and feel like a part of the wilderness. Cozy up in one of our weekend cabin rentals or vacation homes in New Mexicos scenic town of Red River. Our cabins and homes are rustic in design, with log and stone features to accentuate that one-with-nature feel. You will feel right at home in these cozy properties, many of which feature warm and inviting fire pits and fireplaces. Our weekend home rentals accommodate groups of various sizes, from honeymooning couples to larger families. Although many of our cabins and houses are smaller properties, they still feel spacious and comfortable. We have homes and cabins at several locations to fit whatever experience you are seeking. We have properties in town for vacationers who want the shops and dining options to be easily accessible. Our cabins by the river offer a secluded experience for those looking for a quiet getaway. Here you will be at the heart of all the amazing Red River wildlife, with the possibility of sighting deer, bears, elk and bald eagles. We strive to be the most accommodating and hospitable hosts during your stay at one of our cabin rentals in New Mexico. At Red River Real Estate, we want the best for our guests in order to create memorable getaways. As active members of the Red River community, we take pride in our local expertise and ability to make your stay with us unforgettable. Concierge services are available to help our guests navigate their trip. Start your ideal getaway by exploring our weekend house rentals. Red River, New Mexico, is a popular destination for travelers in search of a beautiful getaway that offers activities of all sorts. The diverse terrain has much to offer with its breathtaking sights and opportunity for adventure. Ski and snowboard in the mountains during the winter months or hike and bike along the streams in the summer. After interacting with the great outdoors, explore every aspect of the small-town environment. Many restaurants in Red River offer views of the extraordinary landscape, along with live musical entertainment. Peruse the assortment of specialty shops in the area or check out the many scheduled activities and attractions going on throughout the season. 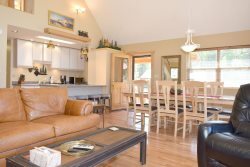 Whether youre looking for an active vacation or a relaxing getaway, Red Rivers unique community has something to offer for every traveler. Contact us with questions about our weekend home rentals or start your search by checking out our property listings below!